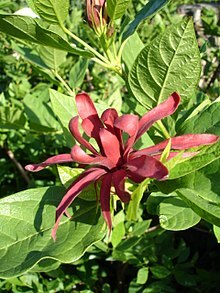 Calycanthus (sweetshrub) is a genus of flowering plants in the family Calycanthaceae, endemic to North America. The genus includes two to four species depending on taxonomic interpretation; two are accepted by the Flora of North America. Calycanthus plants are deciduous shrubs, growing 1–4 m (3.3–13.1 ft) tall and wide. The bright green leaves are opposite, entire, 5–15 cm (2.0–5.9 in) long and 2–6 cm (0.79–2.36 in) broad. The bark has a strong camphor smell that is released when stems are scraped. The smell remains strong on twigs that have been stored several years in a dry environment. The strongly scented flowers are produced from late spring through early autumn for C. occidentalis, and April to July for C. floridus. They are 4–7 cm (1.6–2.8 in) broad, with numerous dark red to burgundy to purplish brown tepals. Typical of the family Calycanthaceae, the flowers lack distinct sepals and petals, but instead have distinct spirals of tepals. The lotus-shaped flowers can resemble a small magnolia flower. They are pollinated by beetles in the family Nitidulidae. The fruit is an elliptical dry capsule 5–7 cm long, containing numerous seeds. C. f. var. glaucus (syn. C. fertilis)—eastern sweetshrub; twigs glabrous (smooth). Sinocalycanthus chinensis (C. sinensis)—Chinese sweetshrub, Chinese wax shrub, native to eastern China, with white flowers, first described in 1963 as Calycanthus chinensis: Sinocalycanthus is a monotypic genus in the family Calycanthaceae. Both species of Calycanthus were used as a traditional medicinal plant by Native Americans. The indigenous peoples of California also used C. occidentalis in basketweaving and for arrow shafts. Both Calycanthus species are cultivated as ornamental plants by plant nurseries, including in the United States and England. C. occidentalis is planted in traditional, native plant, and wildlife gardens, and for natural landscaping and habitat restoration projects, primarily in California and the Western United States. It was introduced into cultivation in 1831. C. floridus is also planted in gardens, as a specimen shrub, or for hedges. Mark Catesby found it in the Piedmont woodlands of the British Province of Carolina in 1732. He described it, with its bark "as odoriferous as cinnamon", but did not name it. The colonial planters of the Carolinas transplanted it into their gardens, and the botanist Peter Collinson described it to Linnaeus and imported it into England from Charleston in the Province of South Carolina around 1756. Calycanthus oil, distilled from the flowers, is an essential oil used in some quality perfumes. The flowers of C. occidentalis have a spicy, sweet scent. The flowers of C. floridus were compared to a bubble-gum scent by one reference. ^ Arnold Arboretum, Harvard University: "Presenting Sinocalycanthus chinensis-Chinese Wax Shrub; Gerald B. Straley, 2014. ^ Catesby, The Natural History of Carolina (1732). ^ Groom, N. The New Perfume Handbook, second ed., Springer, 1997, page 48. ^ iVillage Garden Web: "Which shrubs smell good list"
Wikimedia Commons has media related to Calycanthus.